"O Lord Jesus Christ, two favors I beg of you before I die. The first is that I may, as far as it is possible, feel in my soul and in my body the suffering in which you, O gentle Jesus, sustained in your bitter passion. And the second favor is that I, as far as it is possible, may receive in my heart that excessive charity by which you, the Son of God, were inflamed, and which actuated you willingly to suffer so much for us sinners." In response to his earnest prayer, the Lord appeared in the form of a seraph, or a six-winged angel (They are usually considered the highest order of angelic beings, immediately above the Cherubim, and their special duty is to love God). Then Jesus bestowed on St. Francis the wounds of his suffering. St. Francis had been marked with the love of Christ, the stigmata. St. Francis died two years later in 1226, leaving the world the Franciscan Order, which became synonymous with the Seraphic Order. To this day, seraph wings and seraphs are symbolic of the Franciscan Order. The final Rule of life for Franciscan friars was also approved on this day in 1223. 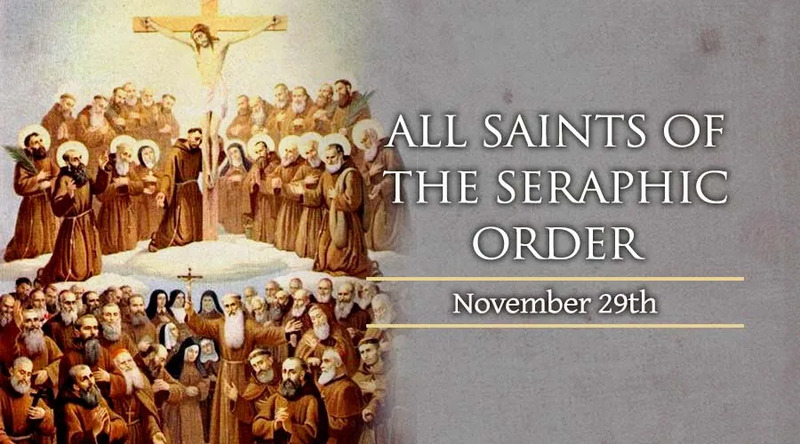 To commemorate this, and all the saintly examples produced in the Franciscan Order, on this day all the saints of the Seraphic order are remembered at Franciscan churches.